Dans le Noir: Would You Dine in the Dark? Dans Le Noir is a restaurant like no other. 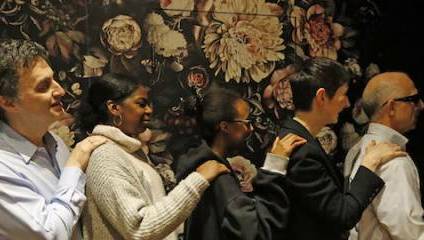 Instead of your usual sit down meal, brave diners are led into a blacked-out room and are subsequently served in total darkness by visually impaired waiters, all whilst sharing a table with other guests, making for one of London’s most remarkable and novel dining experiences. Standing outside in charming Clerkenwell, the restaurant appears like any other. But inside, you will be introduced to your waiter, who will explain the format of the evening, easing any nyctophobic nerves before entering the dining room. This will be the last time you see daylight for the duration of your meal – but don’t panic, as your waiter will guide you to your table. The darkness means the rest of the senses are deeply heightened, allowing you to tune into the cacophony of giggling echoing throughout the room and sniff out the wafting scents of the surrounding dishes. Just try not to drop your fork or spill your drink! Once seated, don’t forget to introduce yourself to your new dinner companions. Chatting with complete strangers in such a bizarre setting can be an astonishingly welcome (if surreal) experience, and is part of the fun at Dans le Noir - don’t be surprised to find yourself discussing personal anecdotes that you would never usually share with strangers! Dished up in the dark are four different surprise set meals, to be selected beforehand from the ‘trust the chef’ white menu, comprising of an exotic selection of meat and seafood, the red menu of meat-based dishes, the blue menu of pescatarian dishes and the vegetarian or vegan green menu, meaning all guests can enjoy a surprise meal while being assured that their dietary requirements are being catered to – no nasty surprises here. Our critic went for the vegetarian green menu, although the white menu also comes highly recommended. The dishes are revealed on exiting the dining room, but much of the amusement at Dans le Noir comes from having a guess while you’re eating – it’s striking just how easy it is to piece together a dish relying on taste and smell - so be warned, spoilers ahead! From the green menu on the day of our visit, starters were plump, silky disks that in the dark could be mistaken for scallops. The earthy tones however soon corrected the taste buds - king oyster mushrooms. Continuing on to the main, succulent chunks of spongy, warm tofu steak came as a welcome change from the chilled starter, and a vegetable selection including tender stalks of asparagus and leek parcels was the perfect accompaniment. Win-win: a main that’s both satisfyingly tasty and healthy. Don’t be afraid to place a finger into the bowl to check if you’ve managed to scoff the lot – in fact, the waiters at Dans le Noir even suggest eating with your hands if you find it easier. If you’re lucky, you could find yourself with the aroma of melted chocolate beneath your nose: that means you’ve lucked out, and been served the chocolate fondant pudding. Soft, gooey and paired with a dollop of zesty passionfruit sorbet, the dessert is so delicious you may temporarily forget you’re wolfing down a three-course meal in utter darkness. The experience at Dans le Noir doesn’t stop there, as you can learn to order a surprise cocktail in sign language with one of the hearing-impaired waiters in the ambient Otra Vista Social Club ‘Silent Bar’. In all, Dans le Noir makes for a truly unique evening. For even those of us who might still be afraid of the dark (don’t worry, we won’t tell), the experience is both exciting and humbling, topped off by genuinely good food – though we can’t speak for the presentation! In fact, we’d be willing to bet Dans le Noir wouldn’t fail to intrigue even the most apprehensive among us.